As my regular readers probably know by now, I have been on a bit of a frittata kick lately. They are super easy to make, healthy and you can customize them easily with whatever vegetables (or meat) you prefer. Last Saturday morning, I was trying to figure out what to make for breakfast. I had some leftover butternut squash, so I decided to go for it. The original recipe I found (at Cookie and Kate) served more people and had a fried sage topping. I am the only one in our house who eats frittata, so I always cut it down to 1-2 person size. In addition, I don’t keep fresh sage on hand, but I had plenty of kale, so I decided to improvise. Personally, I think it turned out great!! In a medium bowl, whisk together eggs, milk, garlic powder, salt and pepper. Whisk in about half the cheese. In an oven-safe saute’ pan, heat 1 tablespoon olive oil over medium heat. Add the onion and cook until slightly translucent. Add squash and stir. Cover the pan and reduce the heat to medium-low. Cook until squash is tender and cooked through, stirring occasionally, approximately 8 minutes. Uncover the pan, add a bit more olive oil, then raise the heat back to medium and cook until the excess moisture has evaporated and the butternut squash is starting to turn golden on the edges, about 5 more minutes. Turn the heat down to low. Arrange the butternut in an even layer in the bottom of the skillet. Whisk the egg mixture one last time and pour it into the pan. Sprinkle the frittata with the remaining cheese. Put the pan in the oven and bake about 15 minutes, until just set in the middle. 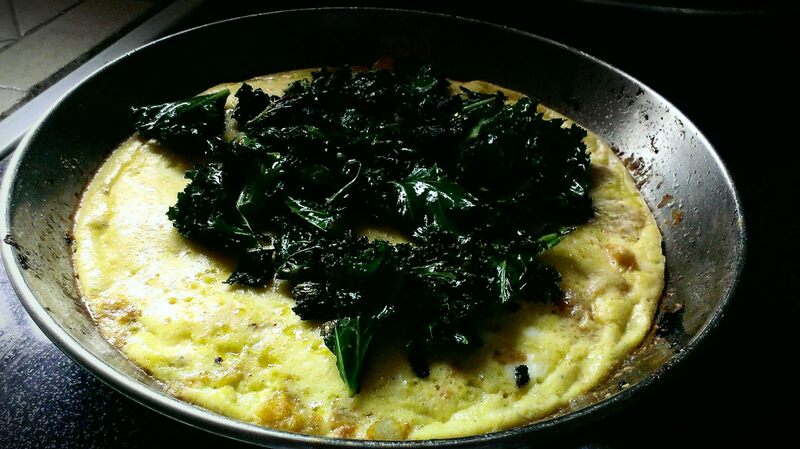 While the frittata is baking, fry the kale: Heat oil in a large medium-size non-stick skillet over medium heat. Add the kale, garlic powder, onion powder and salt and toss to coat. Let the kale get crispy. 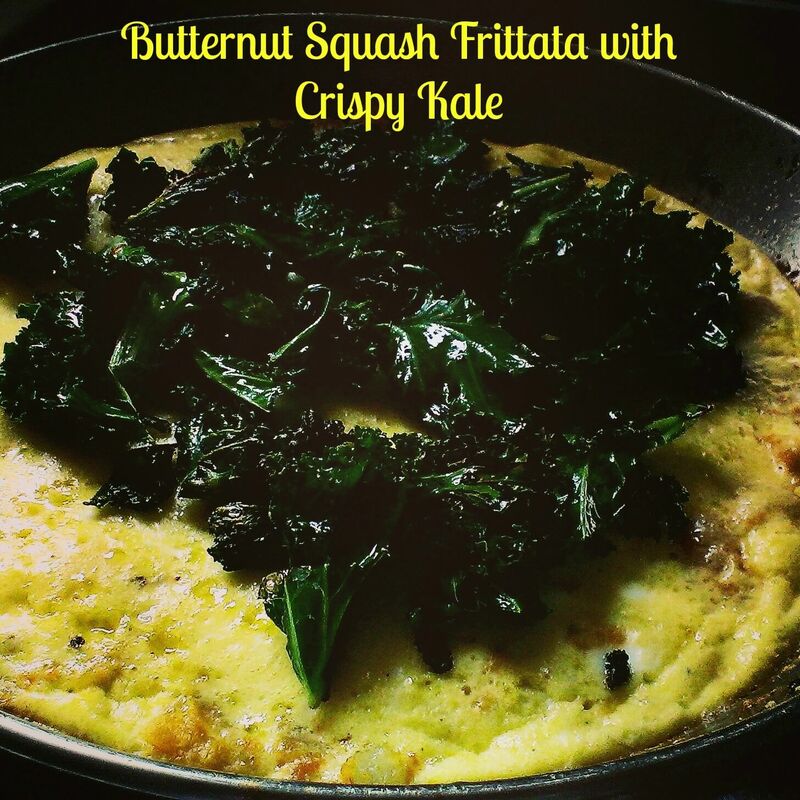 Once the frittata is done, top with crispy kale and serve hot.